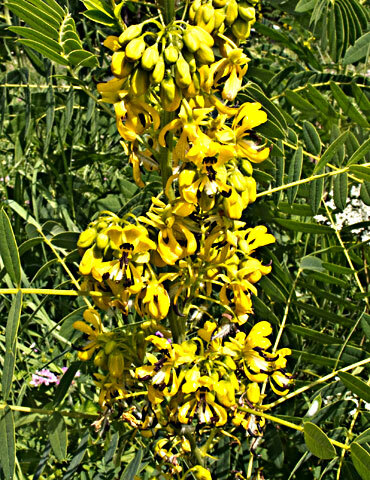 Wild senna is a large, long-lived, herbaceous perennial, legume, up to 6 feet tall. The stout, central stem is light green, and slightly hairy in the upper stem and at the base of the upper compound leaves. 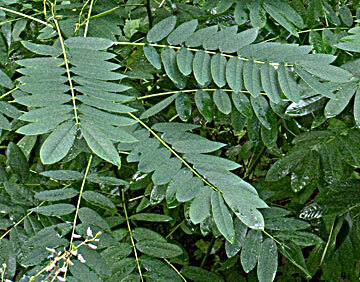 The compound leaves are even-pinnate with about 10 – 20 leaflets. The medium to dark green leaflets are individually up to 2 - 5 centimeters across. Each leaflet is oblong, with smooth margins and a pointed tip. Near the upper base of a compound leaf is a small club-shaped gland; this gland secrets nectar to attract certain kinds of insects. From the axils of the upper compound leaves upright racemes of yellow flowers form from July – August. Each unscented flower is about 15 millimeters across; has 5 pale yellow sepals and petals, 10 stamens with black anthers and a conspicuous pistil with long white hairs. The dark brown seedpods are about 10 centimeters long when fully mature in September – October. The seed pods have 10 – 18 segments and split explosively. There are about 50 seeds/gram. The flowers of Maryland Senna have styles with short appressed hairs, while the flowers of Wild Senna have styles with long spreading hairs. Maryland Senna also tends to produce fewer flowers than Wild Senna, although variations in environmental conditions can produce exceptions to this rule.